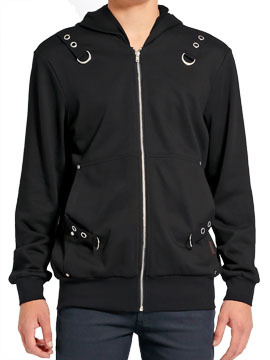 Tripp NYC D-Ring Grommet mens long sleeve zip front hoodie features black straps accented with metal d-rings and metal grommets on each shoulder and near side pockets. Tripp NYC is a exclusively handcrafted designer brand. A favorite among musicians,artists and music enthusiasts. 100% Cotton. Color: black.